Product prices and availability are accurate as of 2019-04-18 01:21:24 EDT and are subject to change. Any price and availability information displayed on http://www.amazon.com/ at the time of purchase will apply to the purchase of this product. 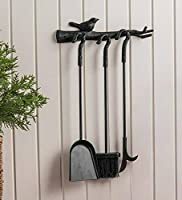 This compact Bird On Branch Fireplace Tool Set hangs for space-savings. This handy set has everything you need to keep your hearth neat and tidy. Plus, the attractive, functional design wall-mounts to keep clutter to a minimum. Cast iron bird-on-branch hanger and steel tools feature a classic black finish. Includes shovel, poker and broom. Hardware included.